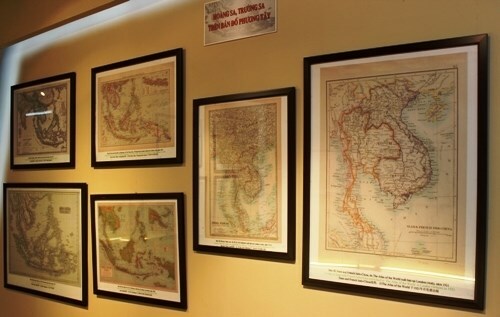 Dong Nai (VNA) – An exhibition displaying maps and materials confirming “Hoang Sa (Paracel) and Truong Sa (Spratly) archipelagos belong to Vietnam – historic and legal evidence” kicked off in southern Dong Nai province on July 19. The exhibition introduces nearly 100 maps, materials and images collected from various sources that have been published by researchers, and local and international scholars. All materials, maps and images confirm Vietnam ’s sovereignty over the two archipelagos. The main groups of materials in the exhibition are Chinese maps, Vietnamese nom-language maps and French versions issued by the Vietnamese feudal dynasties and French administrations in Indochina from the 17th to early 20th century, affirming the assertion, exercise and protection of Vietnam ’s sovereignty over the two archipelagos. It also features copies of documents issued by the Socialist Republic of Vietnam from 1975 and some materials and publications complied and published by Western countries from the 18th to 19th century as well as some documented images on the exercise and protection of Vietnam ’s sovereignty over the two archipelagos from 1930. The exhibition also displays sets of stamps, documented images and research works by Vietnamese and foreign scholars. Noteworthy materials include four atlases published by the Qing Dynasty and the Republic of China government – one Atlas of the Chinese Empire (published in 1909), the Whole China Map (1917), and two books of Postal Atlas Maps in 1919 and in 1933. These atlases are the products of the programme of building a Poastal map initiated by the Qing Dynasty in 1906 and was continued by the Republic of China government. These maps show China’s southernmost point as Hainan island and do not mention Hoang Sa and Truong Sa islands at all. The exhibition also displays the atlas Universel, in six volumes, compiled by Philippe Vandermaelen (1759-1869), a Belgian cartographer in 1827. Volume II includes the map “Partie de la Cochinchine” showing the Paracels as belonging to Vietnam . The exhibition is one of the important public communication campaigns to raise awareness, unity, the sense of responsibility of people, including overseas Vietnamese, particularly the young generation, in protecting and affirming Vietnam ’s sovereignty over Truong Sa and Hoang Sa.